Richard Amos Ltd is a multi-disciplinary practice, providing you with a one stop shop for Architectural, Energy Efficiency, Surveying and CDM Principle Designer Services for your building project. We provide Building Surveying, CDM Principle Designer Services, Fire Risk assessment, Creative Design and a full Architectural service from project inception to completion. The Company is well established and celebrated its 27th year in business in April 2015. Over this time, through the expertise of the Directors and experienced staff, the company has built up a solid client base working for Housing Associations, Farms and Estate owners, Businesses and many private individuals. Creative and innovative energy efficient design on housing, commercial, industrial and farming projects. We provide a full Architectural service from project inception through to completion. 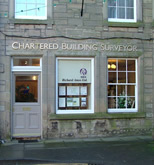 A full range of Building Surveying and Building Conservation Services, including measured building and land surveys. Construction, Health and Safety expertise and advice for your project. We have 2 Members and 1 Associate of the Institute of Construction Safety. The firm has qualified Energy Assessors who can provide an Energy Performance Certificate (EPC) and report on new and existing dwellings and commercial buildings. The report on an existing building will provide advice on upgrading its thermal efficiency and on work that should qualify for The Green Deal. We have an office in Duns and a contact point in Dunbar serving the Scottish Borders, North Northumberland, the Lothians and beyond.